[140 Pages Report] The global gene panel market is expected to reach USD 2.95 Billion by 2023 from USD 1.05 Billion in 2017, at a CAGR of 19.2%. The base year considered for the study is 2017 and the forecast period is from 2018 to 2023. The study estimates the gene panel market size for 2018 and projects its demand till 2023. In the primary research process, various sources from both demand side and supply side were interviewed to obtain qualitative and quantitative information for the report. For the market estimation process, both top-down and bottom-up approaches were used to estimate and validate the market size of the gene panel market as well as to estimate the market size of various other dependent submarkets. All possible parameters that affect the market covered in this research study have been accounted for, viewed in extensive detail, verified through primary research, and analyzed to get the final quantitative and qualitative data. This data was consolidated and added to detailed inputs and analysis from MarketsandMarkets and presented in this report. Secondary sources such as National Institute of Health (NIH), American Society of Clinical Oncology, Biotechnology and Biological Sciences Research Council, Department of Biotechnology, European Society of Human Genetics, directories, databases, white papers, annual reports, company house documents, investor presentations, and SEC filings of companies were referred to. The gene panel market is a fragmented market with the presence of several small and big players. Prominent players in this market include Illumina, Inc. (US), BGI (China), Agilent Technologies (US), Eurofins Scientific (US), QIAGEN (Germany), GENEWIZ, Inc. (US), Novogene Corporation (China), Personalis (US), Thermo Fisher Scientific (US), F. Hoffmann-La Roche AG (Switzerland), Integrated DNA Technologies (IDT) (US), GATC Biotech AG (GATC Biotech) (Germany), and ArcherDx (US). 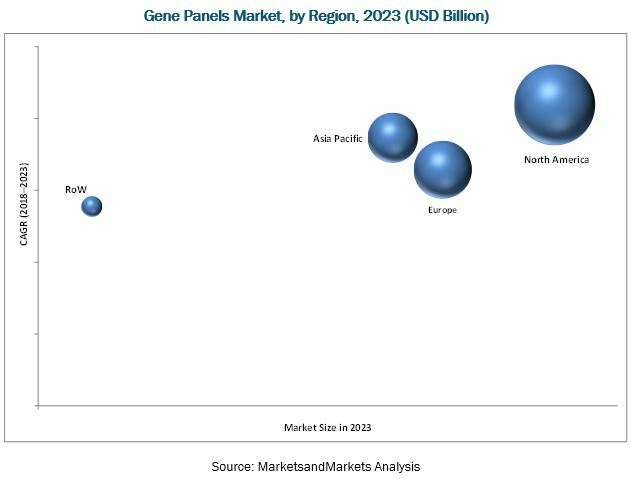 The global gene panel market is expected to reach USD 2.95 Billion by 2023 from USD 1.22 Billion in 2018, at a CAGR of 19.2%. The growth of this market is mainly driven by the increasing prevalence of chronic diseases, growing company initiatives, and rising adoption of gene panel owing to the benefits they offer. This report segments the gene panel market into product & service, technique, design, application, end user, and region. Based on products & services, the market is segmented into test kits and testing services. In 2018, the test kits segment accounted for the largest share of the total market. The growing demand for gene panel in research as well as diagnostics to understand the genetic variability of chronic disorders is propelling the growth of this market segment. Based on design, the gene panel market is segmented into predesigned and customized panels. The customized gene panel segment is expected grow at the highest CAGR during the forecast period. This growth is attributed to the evolving needs of the emerging therapeutic and diagnostic application sectors and the increasing number of clinical and preclinical research studies. 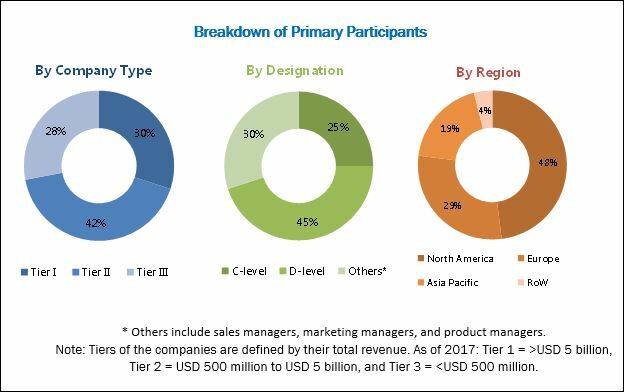 Based on applications, the gene panel market is segmented into cancer risk assessment, diagnosis of congenital diseases, pharmacogenetics, and other applications. The cancer risk assessment segment is expected to be the fastest growing during the forecast period due to the increasing incidence of cancer and growing demand for gene panel in research and diagnostics to understand the genetic variability of cancer. While the gene panel market presents significant growth opportunities, market growth may be hindered due to issues related to genetic data security and accuracy & standardization concerns in diagnostic testing. The gene panel market is fragmented with the presence of several small and big players. Prominent players in this market include Illumina, Inc. (US), Thermo Fisher Scientific (US), Agilent Technologies (US), QIAGEN (Germany), BGI (China), Eurofins Scientific (US), GENEWIZ, Inc. (US), Novogene Corporation (China), Personalis (US), F. Hoffmann-La Roche AG (Switzerland), Integrated DNA Technologies (IDT) (US), GATC Biotech AG (GATC Biotech) (Germany), and ArcherDx (US).